DALLAS, Feb. 28, 2019 /PRNewswire/ -- Pizza or burger? Pie Five Pizza is putting the argument to rest with its new Double Cheeseburger Pizza. 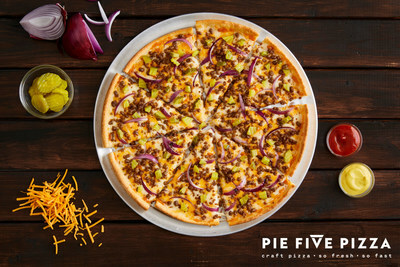 Beginning March 5, guests will get to enjoy the best of both worlds with Pie Five's new Double Cheeseburger Pizza featuring ground beef, mozzarella, cheddar cheese, red onions, ketchup, mustard, and diced dill pickles – the perfect combination of two classics. "Pizza and cheeseburgers are two American staples that you can never go wrong with," said Vice President of Marketing Christina Coy. "This delicious new pizza is packed full of all the typical ingredients you find on a burger and pairs perfectly with all five of Pie Five's crust options. We recommend trying it with ingredients you would add on a burger. Spice it up with jalapenos or Sriracha. Don't like mustard or ketchup? Then make it a barbeque burger pizza. We're not here to judge. Customize it like you customize your burger!" Pie Five will also be hosting a social media sweepstakes during the promotion, giving away free pizza and other prizes. Snap a picture of your Double Cheeseburger Pizza, tagging Pie Five and using the hashtag #gobunless, and showoff how you burger your pizza! The Double Cheeseburger Pizza is available in individual and large pizzas, but only through April 14, so hurry in before it's too late! Pie Five's fast-casual concept provides guests with a fully customizable experience from start to finish. With more than 30 fresh toppings, six savory sauces and five crust choices, there's a delicious pairing to match every guest's preference. In addition to offering low-carb Cauliflower Crust, Pie Five accommodates dietary restrictions with its gluten-free crust and vegan cheese options.